A softphone is a software program or mobile app that can be used to make calls over a voice over internet protocol (VoIP) or virtual phone systems. We evaluated many different VoIP and virtual phone providers with a softphone in order to find the top six, comparing their functionality, pricing and additional features to find the best softphone overall. A softphone has a user interface that resembles that of traditional phones and only needs an internet connection to make and receive calls. When considering which softphone providers were best for small business, we evaluated both VoIP and virtual phone providers that offer softphone apps along with a range of features and functions that would be beneficial to the business owner. Based on the criteria above, we recommend Grasshopper as the best softphone for business. It’s a terrific way to establish a business number and switch between that and your personal number on your mobile phone easily. It provides unlimited calling and many core features that you’ll find in larger, more complex business phone systems, for less than the price of the other providers with no per user/per month pricing. — Andy Abramson, Comunicano, Inc.
Grasshopper is an easy-to-use, feature-rich softphone system and also our best virtual phone system. It offers three affordable pricing tiers that include access to all of Grasshopper’s features on top of excellent 24/7 customer support. In addition to the high level of customization allowed, the ease with which you can switch between business and personal lines is what makes this option best for the entrepreneur or remote salesperson on the go. Grasshopper provides three plans, the Solo, Partner and Small Business. All include unlimited calling, custom greetings, call forwarding and more with prices ranging from $29 for the Solo to $89 per month for the Small Business. There are no fees for additional users, and the number of available extensions is based on the plan you select. Small business: $89 per month for five numbers and unlimited forwarding extensions. One of the reasons why Grasshopper is the strongest is because regardless of the plan you select, you gain access to all the features and offerings of the system. Voicemail transcription, custom greetings, a vanity phone number, an auto attendant to answer and route calls and inbound faxing are all accessible. Grasshopper has an easy to use automated attendant that answers all calls your receive and forwards them to the employee or department the caller is trying to reach. You can set up individual employees or departments as extensions and even provide your callers with a dial-by-name directory so they can search for your remote employees by name. When callers leave you a voice message, those messages can be sent to you as an audio file with an email notification. With the softphone app, those messages can be transcribed and provided as a readable message. These transcriptions are also sent through email but having readable voice messages on your mobile device makes it much easier to prioritize messages and calls. Grasshopper gives you complete control over how calls are routed. You can create extensions and add the number you’d like to have calls forwarded to. You can also define the time of day for call forwarding; either during your business hours, 24/7 or only on the weekends. Grasshopper also offers caller ID customization. With this feature, you can customize how your caller ID is displayed to your callers so they would never know you were calling from a mobile phone. You can also send and receive short message service (SMS) messages with the softphone app and retrieve faxes as PDF documents. Grasshopper has a fantastic setup-and-go option that allows you to begin using your softphone as soon as your account is set up. You can download the mobile app from either the Apple App store or Google Play store and manage all the features of the service from the palm of your hand with the app. Grasshopper misses the mark for businesses looking to add a physical office space with desktop phones because it’s a virtual phone system that forwards calls to another number and doesn’t provide an actual phone line. It also doesn’t support call recording, nor does it have any customer relationship management (CRM) tool integrations, so if your business grows, you’ll need to switch to a more complete system that supports physical phones and more advanced features like Nextiva or RingCentral. Users enjoy the quick and easy setup with Grasshopper and how quickly they can begin using their phones after purchasing their plan. Businesses also enjoy the excellent 24/7 customer support and feel confident that if an issue arises, it’ll be taken care of quickly. For a more in-depth summary of what users think, see our user reviews of Grasshopper. Grasshopper can be set up through the website easily. There are no contracts required to use Grasshopper and any plans you select can be canceled at any time. It also offers a 30-day, money-back guarantee, so you can use the service with confidence for the first month to make sure it meets your softphone needs. Sign up using the button below. Google Voice is a virtual phone system that has an easy-to-use softphone app. What makes it unique is that the entire service is free and the softphone app is compatible with any device. While it offers significantly fewer features than virtual alternatives like Grasshopper, it’s a superb option for the solopreneur who is just getting started and might not necessarily have the budget for one of the other providers. Google Voice is free, which keeps it simple for the solopreneur looking for a no-fuss, easy-to-use system. The only other cost to Google Voice is for international calls for which they have competitive pricing that varies based on the country you’ll be calling. While Google Voice has the least amount of features out of all the providers, it still offers voicemail transcription, call recording, business SMS, conference calling and more. You’ll also get the same call routing and forwarding options as the other providers, and the softphone app makes managing your calls simple. Google Voice transcribes every voice message that you receive automatically. Through the softphone app, you can read the text version of the message or replay the voicemail directly to hear the original message. Google also appears to store your messages and transcriptions indefinitely as in our experience we can still access messages recorded over three years ago through the mobile app. Google Voice gives you a variety of options for managing your calls. You can define what times you want to have the calls routed to your added numbers and define different welcome messages for your callers. With the softphone app, you can choose to make Google Voice your primary calling method on your phone so that all incoming calls and outgoing calls to your phone are managed by Google Voice. A surprising feature to find with a free softphone provider is call recording. With Google Voice, you can record all incoming calls by pushing a button on your phone while on the call. You can also link your Google Voice system with Google Hangouts and host unlimited video and audio conference calls. Some other features provided by Google Voice include call blocking, where you can choose to reject calls from certain numbers automatically. Google Voice also features an integrated spam filtering that sends calls from known telemarketing numbers directly to the junk folder automatically, so your phone never rings when they call. The setup process for Google Voice is perhaps one of the easiest. All you need is a Google account, which you’ll already have if you’re an Android phone user, then you can download the app from the app store, choose your number and get started right away. The experience is natural and there is no difference between using the calling and SMS features on Google Voice versus using your phone’s default features. Outbound caller ID can be important to your business’ image and Google Voice doesn’t offer the ability to customize your outgoing number like Grasshopper. It doesn’t offer an auto attendant to answer and route calls, nor does it offer extensions. Also, porting your existing number onto the Google Voice platform will prove to be challenging if you have a landline number. Customers enjoy the low cost and easy setup of Google Voice and feel that they’re getting a valuable service from a rare, free softphone provider. While this may be expected from a large company offering a free service, users are frustrated by the lack of customer support. Google Voice can be downloaded easily through the Android or iOS app stores, and you can also get started on the web through Google’s website. There is no cost to get started, so once the app is downloaded, you can choose your number and get started right away. Nextiva is our top recommended VoIP provider and offers a full business phone solution to go along with its softphone. Unlike most providers, the softphone app is only available with the mid-range plan or higher. However, business phone features like an auto attendant and voicemail transcription are standard with every plan, making this provider the best option for businesses that want a softphone and complete phone system at a reasonable price. Nextiva offers three tiers of pricing. Office Pro, Office Pro Plus and Office Enterprise. Plans range from $34.95 to $44.95 per user for each month and include features like advanced call management and voicemail transcription. It also offers pricing discounts for larger groups of users with further reductions if you select the annual payment option. The Office Pro is the basic plan offered by Nextiva. On a month-to-month payment, the plan starts at $34.95 for one to four users and can be reduced to $21.95 per month per user for 100 or more users. This plan includes unlimited minutes, advanced call management, voicemail transcription and virtual faxing. Unlike the other two plans or starter plans from other providers, the softphone app isn’t available with the Office Pro. This option is on the higher end of pricing for a basic tier and, therefore, would be best suited for a business that isn’t as concerned with offering a softphone app for its users and works best in a situation where a desktop computer or hardware phone will be the main device used. The Office Pro Plus is structured in the same way as the Office Pro plan, with pricing starting at $37.95 per month per user for one to four users and further reductions up to $24.95 per month per user for 100 or more users. This option includes all the features from the previous tier, plus access to the mobile app, peer-to-peer communication tools, individual conference bridges for users and one professionally recorded greeting. This plan is a good choice for small to medium-sized businesses that are looking for one central system to connect either a local or remote workforce with physical office spaces. While this plan does include access to the app, it’s still a relatively expensive option for entrepreneurs and startups looking for a softphone system. The most feature-rich plan is the Office Enterprise, which is priced on a monthly basis at $44.95 per month per user for one to four users and $31.95 per month if a business has more than 100 users. This plan boasts more than 70 advanced features including everything from the previous plans as well as call recording, call analytics tools and complete CRM functionality with a built-in database for caller and contact information. This plan would be best for a large business looking not only to manage calls but also manage their contact database and team communications from the same tool. The Office Enterprise would definitely not be suited for a small business looking for a simple softphone solution as the wide array of advanced features provided with this plan could be overwhelming. Nextiva’s current setup process isn’t as straightforward as the other providers. Through its website, you can request a quote to be contacted by its sales team, which is a big difference from other providers that allow you to create your account and begin using the service instantly. However, once set up, the user experience is quite pleasant. The softphone app is easy to use, and all functions are accessible easily. Nextiva’s pricing structure is complicated and not well-defined. The provider would stand to benefit from a more straightforward approach to how the pricing is advertised. It would also do well to include more mobile compatible options for all plans. If you need more straightforward pricing and need a softphone without the advanced features provided by the Office ProPlus plan, Grasshopper might be a better choice. Users were happy with Nextiva’s customer support and communications. Overall, the most common complaints tout that the service is over complicated with features, which is to be expected as Nextive is a more complete business phone system. For a more details review of users’ experiences with Nextiva, check out our Nextiva user reviews. You can review all Nextiva plans and pricing details from its website and can schedule a demo of the platform or contact their sales team for a quote that meets your specific business needs. It provides a 30-day free trial, so that you can use the system for a month with no commitment, and you can get started by using the button below. 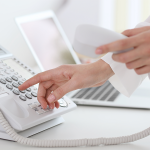 RingCentral is a comprehensive VoIP phone solution that boasts robust capabilities, including a softphone service. It stands apart with its integrated audio/video conferencing solution that supports up to 200 users. This provider is a great option for businesses with a larger remote team that needs conference calling features to connect with team members on their softphones as well as with customers. RingCentral offers four pricing plans priced per user, per month and start at $24.99 per month with the ability to try any tier on a free trial. The Essentials plan starts at $24.99, the Standard plan starts at $29.99, the Premium starts at $39.99 and the Ultimate starts at $54.99. The Essentials is RingCentral’s starter package, meant for up to 10 users and is the lowest-priced option. The cost is $34.99 per month for one user and $24.99 per month per user for up to 10 users. This plan includes the use of the softphone app for unlimited calling within the United States and Canada and SMS, supports up to four people in an audio or video conference call and 100 toll-free minutes. A small amount when compared to the other plans. This plan also includes integrations with Microsoft, Google and Dropbox storage, which isn’t always common with a bottom-tier plan. That doesn’t stop it from being a good choice for a small remote team as it allows them to stay connected through the business system. However, this plan doesn’t offer some features that we see in similar tiers of other providers like call recording and voicemail transcription. The Standard platform offers a volume discount that isn’t available with the Essentials. As your team gets larger, the prices get lower. For one user, the Standard plan costs $39.99 per month while teams with more than 1,000 users pay $24.99 per month per user with variations of pricing discounts in-between for midsized teams. This plan includes all of the features of the Essentials package with 1,000 toll-free minutes and the addition of features like a multilevel auto attendant and call log reports. This plan is best suited for a small to medium-sized business looking for a cost-effective solution to support a growing team. Advertised as the most popular plan, the Premium plan is priced in the same structure as the Standard with one user paying $49.99 per month and teams with more than 1,000 users getting a discounted rate of $34.99 per month per user. It contains all of the features of the Standard as well as automatic call recording, voicemail transcription, inbound caller ID and integrations with business tools like Salesforce and Zendesk. The Premium plan is the most comprehensive package for the lowest price that RingCentral offers and, therefore, is the best for a medium to large-sized business that can take advantage of all the advanced features. This plan also supports up to 100 people in audio or video conference calls, which will be useful in supporting a larger remote workforce. The Ultimate is RingCentral’s last tier, which has one user paying $64.99 per month and teams with more than 1,000 users getting a discounted rate of $44.99 per month per user. The features are the same as the Premium plan but with 10,000 toll-free minutes and the ability to hold audio/video conferences with up to 200 people in a meeting. The additional toll-free minutes and conference calling capabilities would be the best reason to select this plan making it best suited for large remote teams or a calling center with team members who need to be able to collaborate easily. Getting started with RingCentral is pretty straightforward, and the process takes only a few minutes. It does have one of the most robust online portals of any virtual or VoIP phone provider so using the system can be a bit challenging at times. However, larger businesses with more complicated needs will be able to leverage all the features. The softphone app is a pleasure to use, and you can manage your entire account and change settings with the mobile app. The lower-priced tiers, the Essentials and the Standard, are both missing call recording and voicemail-to-text transcription, especially voicemail-to-text transcription, this is a key feature offered by other softphone providers at either its lowest tier or free. If this is a deal breaker and voicemail transcription is a feature you need to have with your softphone, then give Grasshopper or Google Voice a try. Users are pleased with the range of features that RingCentral offers and the overall functionality of the service. They were disappointed with the long customer support phone queues and lack of response via email for support as well. For a more detailed summary of user’s experiences with RingCentral, check out our user reviews of RingCentral. Business owners can sign up for RingCentral’s free trial or jump right in with the plan of their choice by visiting the website. Any questions you might have about the service can be resolved by contacting the sales team. Start your free 15-day trial by using the button below. eVoice is a cloud-based VoIP provider that offers an easy-to-use softphone solution. What makes it unique is its offering of a live receptionist to answer all calls you receive on your number. With standard features like voicemail transcription, eVoice is a great solution for any business that wants to greet their callers with a live receptionist before forwarding calls to their softphone. eVoice’s pricing is set up in four different plans. The prices range from $12.99 to $79.99 per user, per month and all plans include the softphone mobile app. Each plan provides a certain number of calling minutes and phone numbers which can be used for your employees or departments. Each of eVoice’s four plans includes functionalities like call queuing, caller ID, professional greetings, auto attendant, conference calling and more that can all be managed through the softphone app. Premium features like call recording and video conferencing can be added to any plan for an additional monthly cost for each add-on. eVoice’s auto attendant greets your callers professionally, easily routes them to the right extension and eliminates the cost of a full-time receptionist. You can set up different extensions for users, departments and a dial-by-name directory, which can all direct callers to other numbers or directly to voicemail. eVoice can convert every voicemail message you receive into readable text. You can choose to have your converted message sent to you through the softphone app or delivered as an email. A limited number of transcriptions are included for the admin user on accounts, and this feature can be added to all users at a low additional rate per month. With eVoice’s call routing feature, you can create answering rules to forward important calls to different numbers such as home, office and mobile. From the online portal, you can create detailed instructions to route important callers and define which calls will always get sent to voicemail. There a plenty of available features for managing your calls such as call blocking, screening, recording and on-hold music. There are some specific phone features that can also be configured, such as direct-dial numbers, call scheduling and sequential or simultaneous ringing. Like other providers, getting set up with eVoice is straightforward. The softphone app can be downloaded from the app stores and, once your account is set up, you can begin using the app to manage your calls and calling system. The softphone app is intuitive, and the design makes it easy to find what you need with one or two clicks. The most obvious gap with eVoice is the limitations on calling minutes while most of the other providers give you unlimited. Also, features such as a voicemail transcription might seem like a standard feature, but in fact, it does carry an extra cost. eVoice needs to get more clear on what features are standard and which ones carry an additional fee to use. Business owners that use eVoice are happy with call quality compared and how easy it is to use the softphone app once installed. Those who were unhappy with the service didn’t like the limited amount of minutes available with each plan and others had difficulties communicating with customer service. For a more in-depth summary of users’ feedback, check out our user reviews of eVoice. As with most providers, you can get eVoice directly from its website or contact a sales representative over the phone for more information. It offers a 30-day free trial for each of its plans, and you can get started by using the button below. Phone.com is an affordable easy-to-use softphone solution that provides an extensive offering of standard and premium features and flexible pricing. Also our best vanity phone number provider, it provides three flexible pricing plans with the option to add and remove features each month. It would be the best option for businesses looking to customize their softphone plan and don’t mind paying extra to add-on capabilities like call recording and video conferencing. Phone.com has three pricing tiers that can be chosen on a pay-per-minute or unlimited minute basis for outbound calls. Prices range from $22.99 to $27.99 per month for unlimited and $12.99 to $39.99 per month for the pay-per-minute option with a limited amount of calling minutes on each plan. With Phone.com’s softphone, a solopreneur or small business will have access to the same tools that many traditional phone systems provide. The softphone app can be installed either on your desktop or on your mobile app and allows you to manage calls and configure all call forwarding options. Phone.com’s customizable structure means that you can proceed with just the softphone and the service or add these additional features for a small fee. The auto-attendant provided by Phone.com provides your callers with a professional greeting and an automated menu of options which route their calls to extensions or departments within your business. You can customize the menu with your own messages, music and even record the names for the dial-by-name directory that’s also available to callers. With Phone.com’s conferencing capabilities, you can hold video calls with up to 25 attendants and a voice phone conference with up to 200 people on the call. This feature is included with all tiers and with the unlimited calling option, this can prove to be great if you need to hold many video or voice conferences with a remote team. You can use either the mobile app, the desktop app or the web portal to manage your extensions. Regardless of the plan you select, you’ll get unlimited extensions for call forwarding and can customize the rules for routing calls to either an extension or voicemail easily. A customizable auto attendant, on-hold music, voicemail-to-email transcription, faxing and texting are among the many features offered. While many of these features are only available with an additional monthly fee, Phone.com’s structure allows you to add or remove any of these features at any time with just a few clicks. Phone.com takes pride in having a self-service platform. Unlike some providers that require you to request a quote before you get started, you can create your account, download the app and get started using the service in just a few moments. Features such as call routing can be managed with a few clicks, and if your business grows beyond a softphone device, you can purchase adapters to work with desktop phones easily. The flexibility to add on features can be a positive or a negative depending on the needs of the business. While this might appeal to those looking for a simple solution, it may discourage those who find features like call recording and voicemail transcription included with other providers. If you desire a softphone with call recording and voicemail transcription included, then Google Voice might be a better option for you. Users happy with Phone.com have enjoyed the ability to customize their plans and have given many positive comments about how easy the system is to use. Some of those who were unhappy were disappointed with the lack of 24/7 customer support. For a more detailed summary of what users think of Phone.com, check out our user reviews. Business owners can sign up and start using their new Phone.com service within minutes of signing up through the website. Both the pay-per-minute and unlimited plans offer a 30-day, money-back guarantee, and you can get started by using the button below. A softphone is an excellent communication tool for solopreneurs and small businesses. It allows them to have the functionality of a large business with low hassle and cost. Softphones are usually compatible on a range of devices and can support everyone from the solopreneur on the go to large remote workforces. There are a range of reliable providers to choose from, and the best option will depend largely on a business’ size and individual needs. Our recommendation for the best overall softphone provider is Grasshopper. It offers a large assortment of features at a low price and also provides an easy-to-use system with excellent support. There are no contracts with Grasshopper, and it has a 30-day, money-back guarantee for anyone looking to give its solution a try.